Interview from 100 Huntley St.
the EFC National Youth & Young Adult Ministry Roundtable. "Youth Ministry: Now & Not Yet is an important next step in reshaping youth ministry for years to come"
It is no secret that in our post-Christian world young people are leaving the church en masse. This does not have to be the reality. 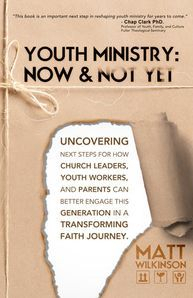 Youth Ministry: Now & Not Yet has sought to uncover the necessary shifts the church can make to engage this next generation in a transforming faith journey and empower those who will walk with them. This book provides a high level perspective on the current impact and effectiveness of youth ministry and what needs to change based on an extensive survey of youth workers and church leaders. This resource provides practical next steps for how the entire church family can improve their youth ministry and make a stronger impact in a young person’s faith experience . As a church leader, youth worker, parent or church member wanting to have a more effective ministry to the next generation, this book will serve as an invaluable resource. Available for coaching, strategic development, trainings, conferences, retreats, & podcasts. Online we will further explore issues of intergenerational experiences, a mentoring movement, healthy youth ministries, social media and more.